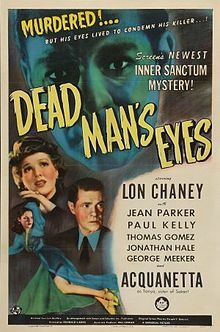 Dead Man's Eyes (1944) was the third of Universal’s Inner Sanctum mystery supporting features starring Lon Chaney Jr. In casting one of its horror stars and sometimes straying tangentially into darker material, the series earns a mention in horror reviews. After that year’s Weird Woman (see earlier review), the next in line was a bit of a marketing red-herring. The title promises one of those lurid, by-now familiar genre plots concerning donor organs transmitting their owner’s homicidal impulses into a new host. The actual story is much more a crime whodunnit where the results of the grafting matter less than the love triangle and murder sleuthery. If you think that’s disappointing, you haven’t seen the woeful performances under the hack direction of Reginald LeBorg whose work we’ve already endured in the previous film plus Jungle Woman and The Mummy’s Ghost (also 1944). Chaney plays struggling painter Dave Stuart - on paper a suitable role suggesting the kind of tortured soul possibilities that he was known for, particularly as the cursed Larry Talbot in The Wolf Man franchise. Initially, he’s a happy man with marriage to the lovely Heather Hayden (Jean Parker) and her wealthy family to look forward to, while looking on with smouldering jealousy is his dark-eyed model Tanya (Acquanetta). In the early calm-before-the-storm scenes, as in other films Chaney always looks unconvincing when called upon to convey the relaxed demeanour of the light leading man. We know though that he is biding his time until he can get stuck into some no-doubt masochistic heavy lifting. There is no such relief for (or from) Acquanetta however who is utterly wooden throughout the entire picture. We’ve already experienced her as the titular Captive Wild Woman and Jungle Woman in which the studio tried to project a raw, native islander image for the real life Mildred Davenport of Wyoming. In those films her lack of talent squeaked by, passed off as a hypnotised other-worldly exoticism. 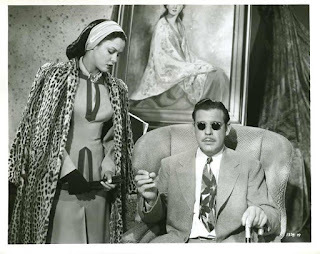 Here in a modern-dress role she is more exposed than in a jungle loin-cloth, her character’s profession only being apt since it would allow her long periods of inexpressiveness. Fortunately it isn’t long before Chaney’s awkward bliss crash-dives into screaming reality when he accidentally bathes his tired eyes with acetic acid instead of eyewash, resulting in crippling blindness. Dr Wells (the Blondie series’ Jonathan Hale) warns that “His mental state will not be good for a while” – tragically good news for horror fans. Less welcome is the opportunity the plot complexities keep providing for Acquanetta to demonstrate sub-zero emotional temperature. Tanya feels guilty, if you can tell, confessing to Dave’s prospective father-in-law Daddy Hayden (Edward Fielding) that she may have mistakenly placed the wrong bottle near Dave. “You must believe me”, she pleads drearily. Hayden rounds on her, matching her mahogany dressing-table with a fitted wardrobe of his own bad acting. “You…you…“, he emotes, waiting for an interruption that awkwardly never arrives. Tanya then positions herself as Dave’s nurse. Was this a scheme of hers all along? It’s impossible to say as she’s unable to telegraph any subtlety of nuance. 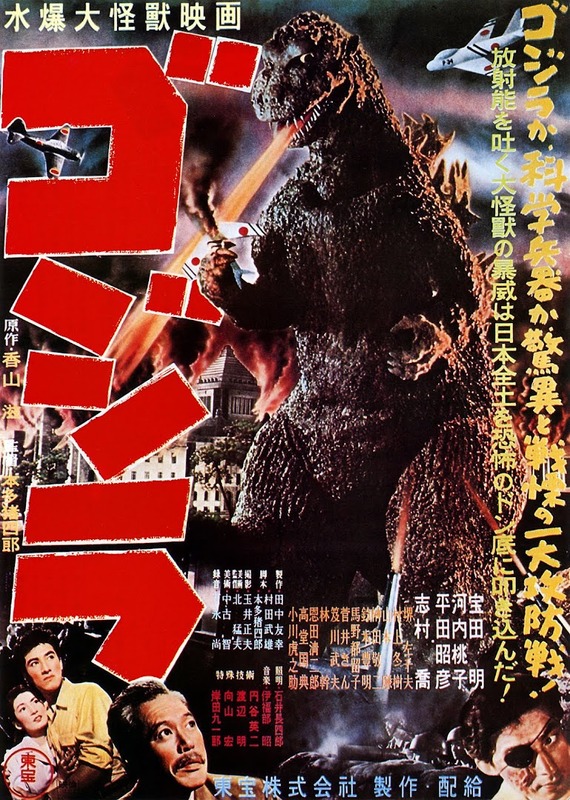 In that respect so is the screenplay, the first by LeBorg collaborator Dwight V Babcock who went on to supply either full scripts for a multitude of low-grade horror films or storylines (e.g. Rondo Hatton 1946 ‘Creeper’ vehicles House of Horrors and The Brute Man). His dialogue works on fewer levels than a broken elevator, sabotaging even those of the supporting cast who are semi-decent, forcing them to simply state their innermost thoughts in clunking exposition. When Daddy Hayden is found dead after offering to donate Dave his corneas post-mortem, Dave, who is found by Helen at the scene, becomes chief suspect. This prompts Thomas Gomez (blustery Count Seebruck in The Climax), who fancies himself the amateur shrink, to aim his portly Capt. Drury at psychiatrist Alan Bittaker scoping for motivational insights. “Blindness is a serious thing to happen to an artist” he observes, proving he shouldn’t give up the cop day job just yet. By sheer coincidence, Paul Kelly who plays Bittaker was in real life convicted of manslaughter himself in 1927 after the involuntarily fatal beating he gave to lover Dorothy Mackaye’s abusive ex-husband Ray Raymond. He was paroled in 1927 and rebuilt his life and career leading to a Tony Award (a tie with Basil Rathbone and Henry Fonda) for Broadway’s 1947-8 season in Command Decision. 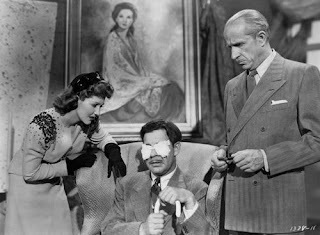 Regular readers of my column will know of my fondness for studying horror movie newspaper front pages and Babcock’s screenplay hits us with such unsubtle gems as ‘BLIND MURDER SUSPECT TO RECEIVE DEAD MAN’S EYES’ for those who were out getting alcohol or sedatives when this plot information was already clearly given. For added amusement, to the right of the aforementioned header is a nostalgia piece about a boxer titled ‘LOOKS BACK TO GOOD OLD DAYS’, the kind of unintentional pun that has me always freeze-framing these covers when they appear. With films as bad as this you must find your entertainment value where you can because there’s very little that’s deliberate. After Tanya is mercifully silenced by a shadowy figure, Drury remarks a priceless tribute upon admiring Dave’s portrait: “That’s a great painting of her. Captures her warmth and her passion”. Since nether quality was evident in the sitter’s performance, it’s only fitting that it actually looks like someone else. 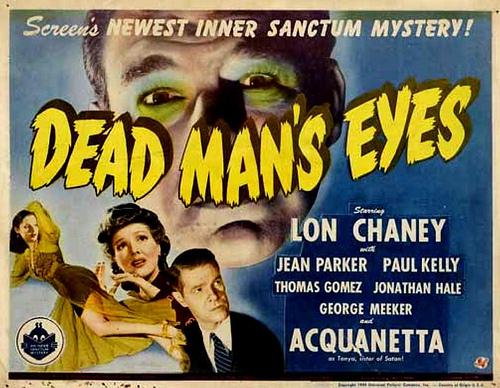 Dead Man’s Eyes could have redeemed itself if reworked as a full-blooded B-movie horror vehicle in which the eye graft possessed the power to plague Chaney with visions of, let’s say, real guilt for example, or if he was the beneficiary of a killer’s peepers as the grisly covert experiment of a mad scientist (Karloff, Lugosi or if wet, George Zucco). Instead, we are treated to am-dram theatrics of Alan being in love with Tanya and Heather propositioned by lounge-lizard Nick, who dissolves later into the seemingly incriminating gibber: “You’re all against me!” By the time we discover Dave concealed the success of his eyesight restoration to catch the real killer, I was longing for some unrestrained nuttiness to liven up the soap-opera. Despite the solved mystery, when it comes to quality film-making the team behind Dead Man’s Eyes haven’t a clue.